maybe a new quilt in a few days? You know that I love the scraps. Lovely scraps and lovely blocks will make a lovely quilt! Great colour combination. Did you print the black squiggly lines yourself? Great combination of colours, and what a wonderful pile of scraps. 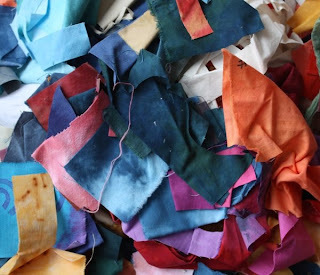 Love your pile of scraps, colours are beautiful. Enjoy reading your blog and seeing your creative work.